How should I set up my fire? The debate about the best way to set up a fire has likely been going on for a few hundred thousand years. While we may not settle it today, we will go through the best ways to set up a fire, and hopefully you can try them out and decide for yourselves. 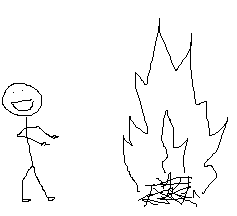 Setting up a fire involves the intricate placement of sticks and logs prior to lighting actual fire. If a set up is done properly, a small amount of exposure to a flame will immediately transform it into a raging inferno. When it comes to fire set-ups, the less amount of fire needed to get it going, the better. This formula was made famous by an old Overhang guide, who could light a fire simply by setting it up and looking at it seductively. The larger the piece of wood, the more heat it requires to ignite. Smaller sticks ignite and burn faster than bigger sticks. Birch bark is an excellent fire starter and is readily available in Ontario. The rules of less exposure to flames = better set up, do not apply when using Birch bark to light your fire. Dead wood only. Cutting down live wood is considered a disqualifying move. The pyramid is one of the oldest fire set ups and still a favorite among people who don’t camp very often. 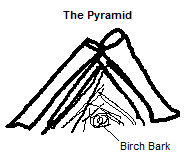 The pyramid involves creating a succession of larger and larger pyramids out of bigger and bigger sticks, over top one another. The idea is that when you light the small sticks at the bottom, the flames rise and the ignite the larger sticks above, and so on and so forth until the whole thing is burning in a neat triangular fire. The problems with the pyramid are glaringly obvious to anyone who uses this method. First, it takes a ridiculous amount of time and patience to set up. Making a pyramid involves delicately balancing sticks against each other, which is difficult in the best of circumstances, and brutally frustrating in the rain or in bug season. Second, pyramids are wider on the bottom than on the top. This means that more of the combustible wood is actually sitting on the ground next to our flame, rather than over top of it. With only a fraction of the wood available to ignite, the pyramid is prone to failure. Finally, and most obviously, once the pyramid does light, it burns through the sticks, which forces them to break and collapse. Since other sticks are leaning on them, the whole thing tends to fall apart, if you haven’t kicked it down already. The Log Cabin is a substantial upgrade from the Pyramid, but in its pure form leaves a lot to be desired. That being said, with some tweaks, this is one of the most effective set ups that we know of. Let’s first look at the original. The Log Cabin is like a real-life hashtag with 2 pieces of wood laid in one direction, and then two pieces on top laying in the other direction. The pattern repeats 2 or 3 times depending on how big you want the fire to get. Inside the middle of the grid, we place our smaller sticks and flammable material, and then we light it through one of the lower openings in the side. If all goes well, the small stuff on the inside catches, and the rising flame brush against the sides of the larger logs, eventually igniting them as well. The science behind the set up makes a lot of sense. Rising flames are surrounded by combustible material, so little heat is wasted. There are several large openings on the sides for oxygen to enter the system, while creating a bit of a shield against heavy wind. Once the fire is lit and our logs begin to break, the weight of the upper logs collapses down and the structure can often maintain its shape. The downside is getting it started. Because the middle area where the fire will be started is surrounded by larger logs, it’s not that easy to access. Without easy access, it can be hard to start the fire in the first place. Attempted once a year at a hippy festival in Nevada, this structure is several stories high, but appears to ignite fairly well. Beware of forest fires. Our last design takes us back to the Log Cabin, but with a simple modification. In this version, we leave extra space for our set up by omitting one of the lower logs, and instead prop up our upper logs with smaller blocks of wood or rocks. The end result would be something very similar to the log cabin, but with space to manipulate the smaller sticks to make it easier to light. This does make the structure a bit more unstable, but there are several different creative ways to work around this. The log cabin-style designs are my own favorite, because once the fire is lit, they are easy to maintain and you avoid the problem of unpredictable collapses. They can also be built overtop existing piles of embers to create a stable new fire.